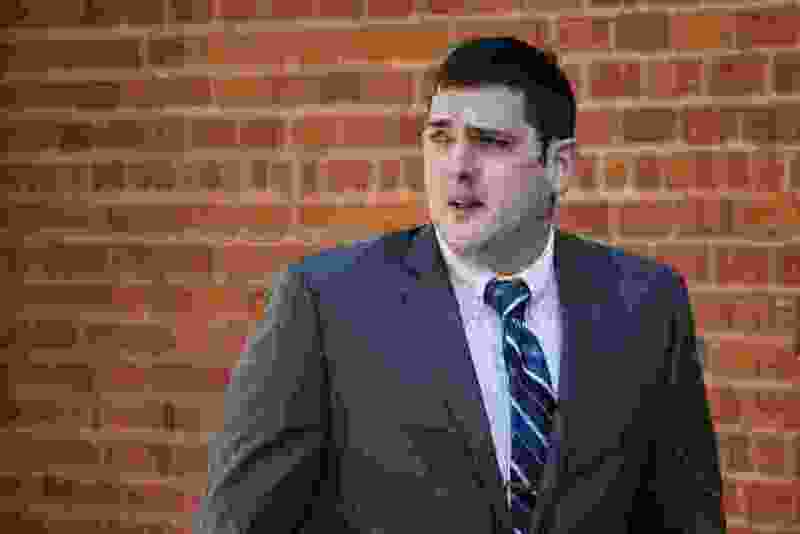 (Matt Rourke | AP Photo) Former East Pittsburgh police officer Michael Rosfeld, charged with homicide in the shooting death of Antwon Rose II, walks to the Dauphin County Courthouse in Harrisburg, Pa., Tuesday, March 12, 2019. Pittsburgh • A prosecutor urged jurors Tuesday to focus on a white police officer’s frame of mind when he shot and killed an unarmed black teenager near Pittsburgh last summer. Rose had been riding in the front seat of an unlicensed taxicab when the backseat passenger rolled down a window and shot at two men on the streets of North Braddock. The shooter was Zaijuan Hester, 18, of Swissvale, who pleaded guilty Friday to aggravated assault and firearms violations for the shooting, which wounded a man in the abdomen. Hester told a judge that he, not Rose, did the shooting. A judge ruled Monday that jurors will hear evidence of that shooting but likely will not hear about a robbery that occurred several hours earlier. Police Sgt. Brian Hodges of North Braddock testified Tuesday that he and Rosfeld responded to the drive-by, and that Rosfeld went in search of the car spotted leaving the scene. A short time later, Rosfeld pulled it over. While Rose ran from the vehicle, Rosfeld shot him three times — in the right side of his face, in his elbow and in his back — a bullet tearing through his heart and lung. In its opening, the defense asserted that Rose was complicit in the drive-by shooting, identifying the target to the gunman, Hester. Rose had an empty ammunition clip in his pants when he was killed, and two handguns were recovered from inside the vehicle. The prosecutor urged jurors to focus on what Rosfeld knew about any of that when he shot Rose. Rosfeld initially told investigators that he saw something in Rose's hand that Rosfeld thought was a gun, according to a police affidavit. "This observation caused him to step from behind the cover of his car door to acquire a better view," the affidavit said. "He then fired his weapon." Rosfeld had been on the East Pittsburgh police force for just a few weeks after working for other departments over seven years. After the shooting, East Pittsburgh shut down its police force and began to rely on state police to cover the territory.